I.B. Tauris has published a second major biography of an Iranian leader in less than a year. Last fall, we ran an excerpt from the first: Cyrus Ghani's Iran and the Rise of Reza Shah. The following are excerpts from Baqer Moin's Khomeini: Life of an Ayatollah. Moin is a specialist on Iran and Islam and is Head of the BBC's Persian Service. Also see related photos by Jahanshah Javid. Khomeini's family are Musavi seyyeds; that is they claim descent from the Prophet through his daughter's line and the line of the seventh Imam of the Shi'a, Musa al-Kazem. They are believed to have come originally from Neishabur, a town near Mashhad in northeastern Iran. In the early eighteenth century the family migrated to India where they settled in the small town of Kintur near Lucknow in the Kingdom of Oudh whose rulers were Twelver Shi'a - the branch of Islam which became the official state religion in Iran under the Safavids and to which the majority of Iranians adhere today. Ruhollah's grandfather, Seyyed Ahmad Musavi Hindi, was born in Kintur and was a contemporary and relative of the famous scholar Mir Hamed Hossein Neishaburi whose voluminous history of the religion, the Abaqat al-Anwar, is sometimes described as the pride of Indian Shi'ism. Seyyed Ahmad left India in about 1830 to make a pilgrimage to the shrine city of Najaf in present-day Iraq, and possibly to study at one of its famous seminaries. He never returned. In Najaf he struck up a friendship with Yusuf Khan Kamareh'i, a landowner who lived in the village of Farahan not far from Khomein who persuaded Ahmad to return to Iran with him. It is thought that the two men made the journey around 1834. Five years or so later, in 1839, Ahmad purchased the large house and garden in Khomein which was to remain in his family for well over a century and a half. Whether he had brought money with him from India or made it in Iran, he was clearly at this time a man of substance as the 4,000-square-meter property cost him the very large sum of 100 tomans. He had already married two wives from the district, Shirin Khanum and Bibi Khanum, and in 1841 he took a third, his friend Yusef Khan's sister Sakineh. Ahmad had only one child from his first two marriages, but Sakineh gave him three daughters and a son Mostafa, who was born in 1856. The family continued to prosper as , over the next decade, Ahmad bought land in the small villages of the region, and in Khomein itself an orchard and a caravanserai. He died in 1869 and, as he had instructed in his will, the family took his body by mule to the holy city of Karbala for burial. Mostafa seems to have ... lived the life of a landed provincial notable whose clerical background, wide-ranging connections in the region, and strong personality enabled him to become something of a community leader. Inevitably, hagiographical accounts of Mostafa's character have, given the almost god-like status achieved by his youngest son and the lack of contemporary records, proliferated since the 1979 Iranian Revolution. These tend to portray him as a man who came to be a popular and influential figure because he was "close to the ordinary people" and, unlike many clerics and chiefs "stood by the small farmers and peasants in their problems with the landlords and government officials." But such a position carried its own dangers. On a cold day in March 1903, less than six months after the birth of his third son Ruhollah, Mostafa was shot and mortally wounded on the road from Khomein to Arak. He was only forty-seven-years old. A number of imaginative stories have circulated since the 1979 revolution about this incident... An account that is undoubtedly closer to the truth... is that given by Morteza, who was only eight-years old at the time of his father's death, but, as his eldest male heir, was deeply involved in the events that followed it. 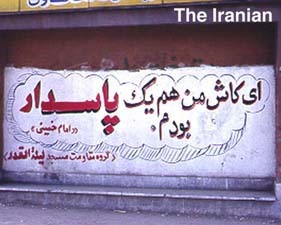 It is worth paraphrasing ... for the vivid picture it provides of the society into which Khomeini was born. In the second and third years of the twentieth century, life for the people of Khomein was, Morteza relates, made particularly miserable by three local khans - Bahran, Mirza Qoli Soltan and Ja'far Qoli - whose predatory ways oppressed the population. The worst of them was Bahram Khan, who was arrested and jailed by Heshmat al-Dowleh, a powerful Qajar prince who owned huge tracts of land in the region. He left for Arak, which was about two-day's journey from Khomein, with ten to fifteen horsemen and armed guards. The next day, as he was riding ahead of the party flanked by only two of his guards, Ja'far Khan and Mirza Qoli Soltan appeared on the roadside. They were unarmed. Sahebeh seems to have been a major influence on the family and legends of her strength and courage abound. Ahmad, Khomeini's son, says that in the absence of a shari'a judge in Khomein, Sahebeh had once carried out his duties for a few days until a replacement could be appointed. If this story is true it is most unusual since in Islam women are not allowed to become judges. Ahmad also relates that: "Two rival groups of the people of Khomein were involved in a shooting incident. Sahebeh interfered and placed herself between the feuding factions, ordering them to stop shooting. Her power and charisma were such that they immediately obeyed her." Whether as a result of his genes, or of influences such as Sahebeh, Ruhollah was clearly a spirited child. The family recalls that he was very energetic, playing all day in the streets and coming home in the evening with his clothes dirty and torn, often bearing the wounds of scraps with his friends. The picture painted for him of his father as a man who campaigned for "truth" and opposed "falsehood", unbelievers and oppressors, may well have deeply affected his impressionable mind and provided a model of conduct for him to look up to.